Hi Aspirants.. 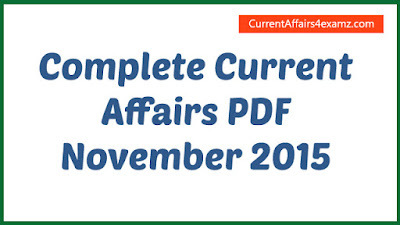 Here is the complete Current Affairs PDF Capsule for November 2015. We have covered all the important happenings from November 2015 in this PDF. This will be very useful for all upcoming exams including SSC, UPSC, LIC/Insurance, IBPS/Bank, Railway & other PSC Exams. We have made little changes in our PDF and now the PDF is more print friendly. From 2016 we are a planning a complete overhaul. Please wait & watch. Also comment your suggestions for further improvement.